Attending ABT’s Swan Lake is like going to a familiar Columbus Avenue restaurant in Manhattan; not much suspense or surprises as the menu rarely changes. In Saturday evening’s performance there were two menu changes that caught my eye: Cory Stearns as Prince Siegfried and Ivan Vasiliev as the evil von Rothbart. Cory has been dancing leading roles since his promotion to Principal Dancer in 2011. I enjoyed his Don Q and his Conrad in Le Corsaire earlier this season. Ivan was great as Ali the Slave in Le Corsaire and in Shostakovich Trilogy, but his Symphony in C fell flat for me. Cory was a gallant and expressive prince Saturday night. His face lit up like a immature boy on Christmas day when the Queen Mother (Karen Uphoff) presented him with a crossbow at his coming of age birthday; soon after he realizes his youth and carefree days are numbered when the Queen reminds him that, as a King, he must choose a bride at the ball. It is time for Prince Siegfried to get serious. Cory’s dancing this year generally impresses me. He is very controlled and never pushes too hard. He has deep soft plies ending his double tours. His turns are nicely paced, never pushing for just one last turn to impress the audience. On his turn sequence in the pas de deux, he performed alternating single and double turns in second, finally pulling for four pirouettes finishing on relevé. Paloma’s dancing was smooth as it was clear that she has done this role before. Cory and Paloma connected well as Cory was in awe of this swan. Ivan is a polarizing dancer; some people love his dancing and some hate his acrobatic, bravura style, with his gymnast body type. I am generally in the former camp because Ivan can do things that very few dancers in the world can do. Here is one example: a slow motion YouTube video from rehearsal of him doing a triple cabriole derriere (to the back). You never know when Ivan will go off and perform a “what in the world is that?” type trick or turn combination. As Rothbart, there is not much opportunity for pyrotechnics as this is a dramatic role that Marcelo Gomes owns. 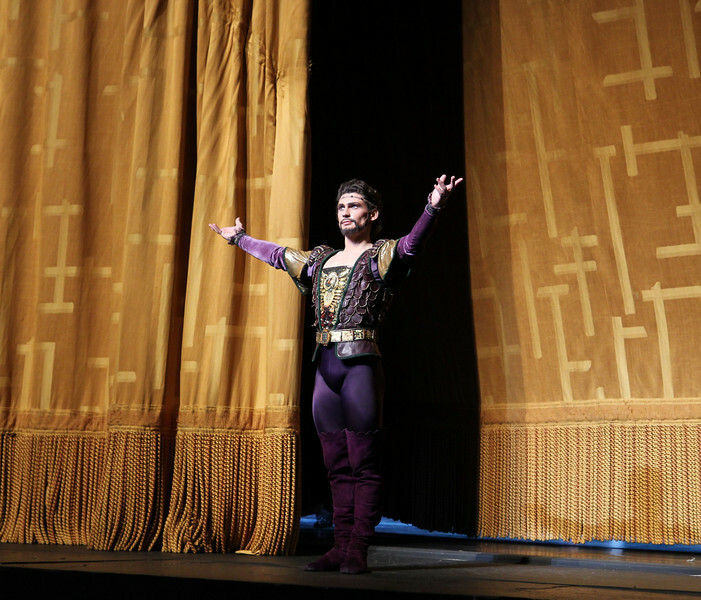 In addition to Marcelo’s great technique, he stands out on the dramatic side, portraying Rothbart as both evil and charming. In one section, Gomes sits on the throne watching the divertissements, tapping his fingers as if to say “I am bored with these people. I can’t wait to cast my evil spell.” Vladimir Malakhov also did a nice Rothbart. Gomes and Malakhov are above average in height while Ivan is short. Some object to a shorter man portraying Rothbart. Although Ivan is not tall, he does have a commanding stage presence. He came on stage in an aggressive manner, with an intense almost mad look and demeanor. His solo was generally controlled with a long arabesque in relevé. At the end of his solo, flirting with the Queen, he looked out of breath. Ivan’s was not the most conventional portrayal of Rothbart, but I did enjoy it. Sarah Lane, Isabela Boylston, and Sascha Radetshy danced the pas de trios. Boylston’s very nice entrechat six (six beats) were on display. Some women struggle with this step, with scratchy, barely discernable separation on the beats. With her beats, it is clear there are six beats. Sasha’s solo was, like most of his work, very steady. In all, the pas de trios was well performed but not particularly memorable. The corps dancing in the first act seemed synchronized without any noticeable missteps. Simone Messmer and Devon Teuscher danced well together as the two swans in Act II. Two up and comers, Joseph Gorak and Luis Ribagorda complemented one another nicely in the Neapolitan dance. The current ABT production is staged by ABT Artistic Director Kevin McKenzie from 2000 and is not well received by critics. New York Times dance critic Alistair Macaulay opines that the ABT and New York City Ballet versions are “tawdry productions” and “…the leading American productions simply trivialize the ballet.” Another New York Times dance reviewer Gia Kourlas says that the production “…drags along like a bird with an injured wing.” I don’t have any perspective on the quality of the ABT and New York City Ballet versions as I haven’t seen any other versions. I think the primary complaint with ABT is the shortening of last lakeside act; I hear that other companies give this part more emphasis. On my “to do” list is to rent DVDs of other critically acclaimed versions for comparison.